Our business activities give us a large sphere of influence when it comes to social accountability, so it is crucial for the many companies and individuals along our supply chain to help the Ricoh Group avoid or minimize unintended negative effects. To that end, we make sure not only our employees, but also the employees of our suppliers, always act ethically. We spotlight this concern in our international guidelines on human rights, labor, the environment and more, and are working continuously to raise our initiatives to the next level. The Ricoh Group, along with suppliers, aims to discharge its social responsibility in the supply chain, by conducting purchase activities on the basis of the following policy: 1) Coexistence and co-prosperity with suppliers by establishing long-term reliable relationships and cooperation, 2) Fairness of transactions (comprehensive evaluation of suppliers based on their participation in corporate social responsibility activities on the basis of economic rationality), 3) Establishment of an environmental management system and reduction of environmental impact through purchasing environment-friendly products, 4) Compliance with the law and 5) Respect for social ethics. The Ricoh Group, along with suppliers, to discharge its social responsibility in the supply chain, is conducting purchase activities on the basis of the following policy. 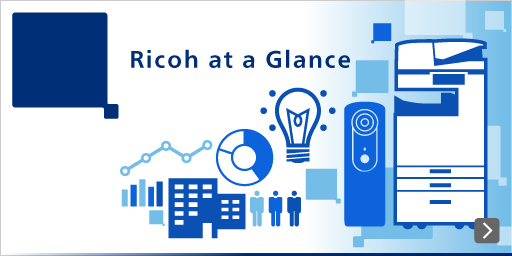 The Ricoh Group builds long-term relationships with suppliers, and thereby aims at coexistence and co-prosperity to prosper together by mutual cooperation. The Ricoh Group evaluates suppliers comprehensively from the standpoint of the commitment and measures to social responsibility, based on the economic rationality, such as quality, price, and delivery, and always promotes impartial and fair transactions, both inside and outside the country. The Ricoh Group promotes the establishment of an environmental management system and the decrease of environmental impact by buying the merchandise having less environmental impact, and contributes to the conservancy and improvement of the global environment as a global citizen. The Ricoh Group conducts purchase activities with the full understanding of applicable laws and regulations and of the purpose of the legislation in each country. The Ricoh Group conductｓ purchase activities in a manner which does not contradict with social ethics, in the entire activities including suppliers, sub-suppliers etc. whether or not there are applicable laws and regulations in the respective country. The Ricoh Group identifies critical suppliers based on the following process. While developing the production sites globally, the Ricoh Group considers the ESG in the supply chain and responds to the challenges of each field, we believe that working together with suppliers to solve the various problems of the global environment and society and to improve will be the driving force for the development of a healthy company and, ultimately will realize a sustainable society. For that we will promote this initiative from the perspective of long-term corporate value improvement. In January 2006, the Ricoh Group established the Ricoh Group Supplier Code of Conduct for our suppliers to make efforts to aim at a better society and global environment and sustainable development of society. All of our suppliers are required to comply with this code of conduct. The Supplier Code of Conduct includes clauses on human rights such as prevention of child labor and environmental conservation.In the 2016 revision, the code was added with the clause on freedom of association based on the ILO Convention. The Ricoh Group purchases materials and parts used to manufacture products in line with Green Procurement Standards. As part of our efforts to help suppliers promote environmental protection, we have developed Environmental Management System (EMS) Guidelines and Chemical Substance Management System (CMS) Guidelines to help the suppliers establish their own EMS and CMS Guidelines in line with those of the Ricoh Group. These guidelines are used to provide suppliers with training and education as well as support in operating the management systems. To help establish a chemical substance management system (CMS) across its entire supply chain, the Ricoh Group commenced a program in fiscal 2005 to train and certify suppliers’ employees as CMS examiners. In addition to internal audits facilitated by their own companies, certified examiners will conduct audits upstream suppliers that deal with important processes involving environmentally sensitive substances and will support them in establishing a CMS. 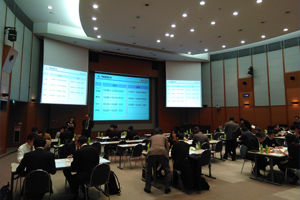 We have continued to conduct a Supplier CMS Trainings in Japan. The training course provides a classroom learning of CMS in the first half and a role-play of CMS examining in the second half. In fiscal year 2017, 91 employees from 76 companies participated and all of them passed the training tests. We will continue to support the level up as examiners. In fiscal 2016, as a CO2 emissions reduction activities with suppliers, we began supporting to switch to clean electricity. We have shared the global warming countermeasures and information of trend on the environment that became a common global issue after the Paris Agreement, with the management of suppliers in order to aim to raise awareness about CO2. Based on practical cases and know-how in the Ricoh Group, we supported suppliers on CO2 emissions reduction activities. In FY 2017, we have achieved the result of CO2 emissions reduction that exceeded last year's. In the future, together with our suppliers, we will continue to practice environmental management that realizes environmental conservation activities and creation of profits. Along with the "Liberalization of electricity", we switched to new electric power in 2016 while struggling to select a company suitable for. It was difficult to narrow down which new power company is good and sometimes we were refused even if asking for an estimate. At the time of expiration of the contract, Ricoh came out with their proposal of switching to PPS taking the CO2 reduction into consideration. In the start of activities, Ricoh explained us in detail the movements of CO2 in the world and what society is asking for. We understood that clean power selection can contribute to the global environment. While we were engaged in environmental activities such as lighting, LED lighting of mercury lamps and introduction of demand system, judging that we can further strengthen, we agreed to immediately. Although we did not take into account CO2 at the time of the previous change, thanks to Ricoh's advices in details from selection of a PPS to how to prepare data and documentation to be submitted, we finally could realize reduction of not only our power cost but also CO2 emission. We will accelerate our environmental activities to contribute to the realization of sustainable society. KISHIRO HIKARI KAGAKU CO., LTD.
Our suppliers are expected to comply with the Ricoh Group Supplier Code of Conduct, which contains rules related to environmental conservation and human rights, such as the prohibition of child labor. The Ricoh Group Supplier Code of Conduct Guidebook is distributed to all our suppliers, and in 2009 we invited all major suppliers to a meeting at which they were presented the Ricoh Group's CSR activities. Our aim was to have them share our values by raising their awareness of the importance of CSR and the Code of Conduct. Also in 2009, we introduced a CSR Self-Assessment System that helps suppliers implement a "plan, do, check, act" (PDCA) cycle by themselves. The system was initially rolled out in Japan and has since been gradually extended to other countries. Company activities that require improvement are identified by these assessments, with the results fed back to the suppliers together with advice and support on ways to meet society's needs and expectations. If a supplier's improvement activities are not sufficient, we would discuss the future business relationship with the supplier. The CSR Self-Assessment System has been used by local suppliers in China since 2010, and was introduced to Thailand in 2013. In fiscal 2017, we held CSR briefing sessions for 7 important suppliers trading on new business (magnetoencephalograph). We shared the global environmental and social issues and the CSR of the Ricoh Group with suppliers and received the word from many suppliers "It was helpful for advancing our CSR activities". After the briefing session, we implemented the CSR self-assessment and confirmed the situation of ethics, environment, human rights, labor, safety and health, etc. according to social trend and external requests. In feedback, we showed their compliance level of codes, not only items for any improvement, but also items that are superior are presented specifically and we tried interactive communication. With regard to the responsible supply chain management of minerals from conflict-affected areas and high-risk areas, in order that companies respect human rights and avoid contributing to conflict through their mineral sourcing practices, it is expected to cultivate transparent mineral supply chains and companies’ sustainable growth by the righteous decision-making on the mineral resource procurement with a view to enabling countries to benefit from their natural mineral resources and preventing the extraction and trade of minerals from becoming a source of conflict, human rights abuses, and insecurity. The Ricoh Group views the issues that the minerals mining or trading in conflict-affected and high-risk areas finances armed groups and fosters conflicts, or closely related to human rights abuses, labor issues or environmental destruction, etc. as an important CSR issue, and continues to secure transparency in the supply chain together with its business partners, also ensures responsible mineral sourcing practices. The Ricoh Group Supplier Code of Conduct has been revised in 2014 for asking suppliers to understand and cooperate with the new provision titled "Responsible sourcing of minerals". From 2012 the Ricoh Group started to study in-house system approaching conflict minerals issues, and established a cross functional task force in charge of dealing with conflict minerals issues, which consists of representatives from relevant departments within the Ricoh Group companies, and began considering what actions to be taken for the issues. And then, we are continuing the activities that are centered on the departments and sections involved in the procurement. In addition, Ricoh, as a member company of the "Responsible Minerals Trade Working Group", launched in May 2012 by JEITA*1, is participating in a Working Group for the entire global supply chain, and studying activities unified in the electronics industry. In 2013, the Ricoh Group participated in the Japan Conflict-Free Sourcing Working Group (CFS-WG) established by automakers and member companies of the "Responsible Minerals Trade Working Group", and has asked the conflict minerals smelters related organizations in Japan to make inquiries about smelters and promote to be the Responsible Minerals Assurance Process (RMAP) conformant continuously. The Ricoh Group addresses this conflict minerals issues referring to the “OECD Due Diligence Guidance for Responsible Supply Chains of Minerals from Conflict-Affected and High-Risk Areas". The Group built a management system that the existing in-house database was customized for the efficient survey, and prepared relevant information for risk analysis. The Ricoh Group identified as many parts and materials as possible which were used in the products manufactured at own factories in 2017 or used in case manufacturing was contracted to the third party in the same year, and requested the first-tier suppliers worldwide from which the Ricoh Group procured them to cooperate with the common survey, and received the responses from over 90% of suppliers. As a result analyzing the response information from the first-tier suppliers, it was confirmed that there was a possibility that a certain number of products contain the parts or materials which originated in the Democratic Republic of the Congo or an adjoining country, accordingly the Ricoh Group conducted due diligence on the relevant first-tier suppliers. The comparison between the smelters and refiners which are certified by the RMAP as RMI*2 published and the smelters and refiners identified through the survey was completed. In the survey of 2017, the Ricoh Group identified 249 smelter companies have acquired the certification of RMAP conformant. In fiscal 2017, we also received inquiries from customers about conflict mineral investigation and responded appropriately to all of them. The Ricoh Group have collected a lot of names of smelters, but some of them could not be identified whether they are really smelters or not in light of publicly accessible Web information. In these circumstances, the Ricoh Group is working to confirm type of the firms in cooperation with other electronic information equipment manufacturers and automobile manufacturers. In addition, we changed the format for the CSR-Self Assessment which includes the question to promote the responsible sourcing of minerals by our suppliers. The results obtained from such Assessment will lead to our follow-up actions for suppliers. Continue to cooperate with industry organizations, such as JEITA, contribute to RMI through JEITA, and do activities of the CFS-WG. Child labor is one of the priority issues of the Ricoh Group's TRM (total risk management) efforts, and relevant departments have been engaged in various projects to address child labor issues. The Ricoh Group has already surveyed the compliance with laws that prohibit child labor by manufacturing sites in Japan and abroad. The survey results have confirmed that there have been no violations. The self-assessment results from supplier companies have also confirmed that there have been no reports of child labor violations. We will continue to monitor child labor.